Your Journeymen and Electrician Trainees can brush up on their safety skills with OSHA training. Four options among our online, self-paced courses! 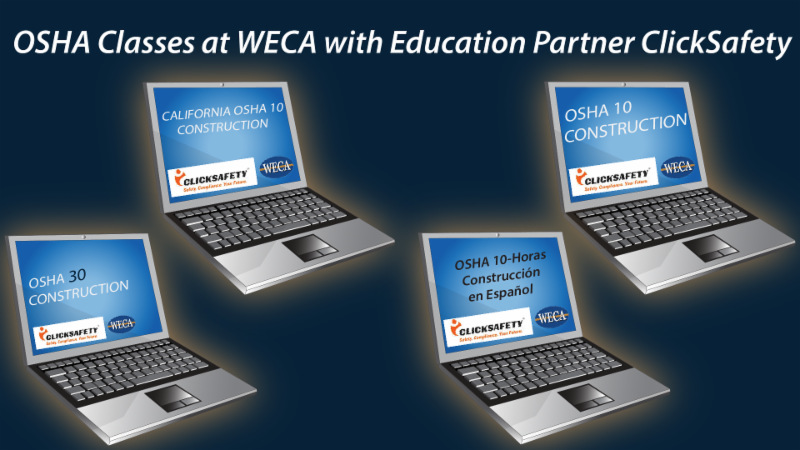 This 10-hour online California OSHA training from WECA partner ClickSafety is an excellent way to receive proper training on important safety and health matters at your work sites. It is specially designed to help keep California workers safe while obtaining their OSHA 10-Hour Card. This 10 hour online OSHA training from WECA partner ClickSafety is an excellent way to receive proper training on important safety and health matters at your work sites. It covers fewer topics than OSHA 30. Este curso de 10 horas del socio de WECA, ClickSafety, es una versión en línea del exitoso programa de OSHA, cubriendo menos temas que el OSHA 30. La capacitación de OSHA en línea es una excelente forma de garantizar que ha recibido la formación adecuada en temas importantes de salud y seguridad en sus sitios de trabajo. This 30 hour online OSHA training from WECA partner ClickSafety is an excellent way to receive proper training on important safety and health matters at your work sites.